Suzaku Lace: Bobble Head Mcdo Happy Meal COMPLETE! 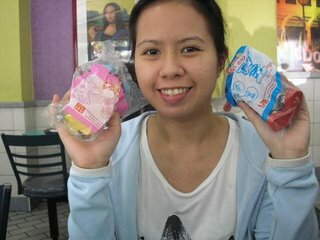 Bobble Head Mcdo Happy Meal COMPLETE! This is me with Birdie and Hamburglar, of course they are in plastics haha. It was 12nn today when i got them. I went to Mcdo Taft for lunch with Azrael and I ate a lot just to complete my set. Im also hungry that's why. and this is what two full-stomached lovers become.